Body by Felicia’s Body Butter is made with refined shea butter and aloe vera. Image from bodybyfelicia.com. The bottom had fallen out of the great snow-bucket in the sky, and my hands were showing the full effects. The inside of the house was bone-dry, especially during those couple of days when the only heat came from our roaring wood fireplace. Mix that with back-and-forth into the wet, freezing outdoors, and my hands let blood more than a few times. By complete chance (or fortune), a high school friend, Felicia Hughes, had recently started a new business, Body by Felicia. She mixes everything by hand, right here in central Arkansas. 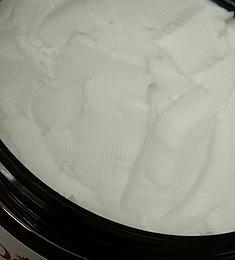 I purchased a couple large jars of her Sweet Heat (vanilla) Body Butter for Christmas gifts, not exactly sure who was getting them. Turns out, I kept one for myself. No more cracking. Since the holidays, I’ve discovered that Felicia’s Body Butter is a great salve for all the handwashing that goes along with frequent cooking. Of course, I cook a lot at home, and now that I teach professionally, my hands are really getting the full wringer. A daily dose of Body Butter keeps them in check. My mom got the other jar. All the rest of the family, while visiting us for a fish fry cookpalooza at New Years, got into my jar and want some for themselves. Felicia, get to mixing some more, girl. 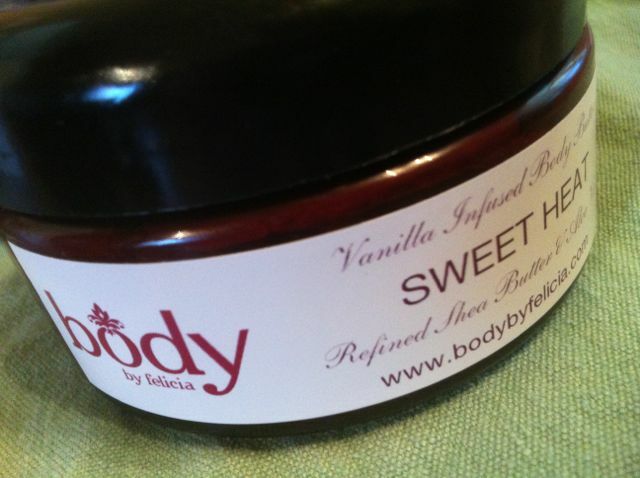 Body Butter is now available in Sweet Heat (spicy vanilla), Pomberry (pomegranate), Honey Kissed (honey and almond) and Butter (unscented). Online ordering is now available for $20 for an 8 oz. jar. plus shipping, or pick some up at SNS Celebrity Styles, 7521 Colonel Glenn. Buy some for your foodie sweetheart (the plain Butter is man-friendly), and trust me, go ahead and get some for yourself, too. Sample gift basket of genuine Arkansas-made foods from Argenta Market. The hubs and I have always had different business ideas floating around in our heads. Around 15 years ago, one that made it as far as “manilla folder of ideas” status was Arkansas-product gift baskets. There were others in town, but none we felt were truly all-Arkansas. Alas, our basket business never really got started. But Argenta Market in North Little Rock, already known for all things local, started doing this very thing for the 2012 holidays, and they’re doing it right. They’d make a super-awesome gift for your Valentine. Honey from K-Bee Honey in Sherwood. It’s our favorite; we buy it by the quart! Baskets include a standard-size honey bear. I’ve been to their hives, and they’re legit! Robbi’s Salsa. Light, smooth (restaurant style), simple, delicious. No crazy ingredients, just fresh veggies in the right proportions. Flours and mixes from War Eagle Mill in Northeast Arkansas. Fresh, locally-ground. Mixes by The Resident Chef. We sampled a few at the open house, and this anti-mix foodie has been converted. No nasty preservatives. Soaps by Southern Girl Soapery. Fellow blogger Stephanie Hamling makes these beauties, and they are truly works of art. My “Hey, Joe” bar uses locally-roasted coffee that scrubs away cooking smells such as garlic. Strawberry-Jalapeño Jelly by Stutzman’s Pantry. You’ve probably had pepper jelly before, but this tangy, unusual combination shows some ingenuity on the part of this local family. My family really enjoyed this on New Year’s Day over cream cheese. Snack sticks from Ratchford Farms. Cleaner, leaner and much more tasty than the classic Slim Jims they resemble. These local meat producers offer elk, buffalo, venison, beef and wild boar products. Over the next few days, I’ll have some suggestions for fantastic foodie valentines you can procure from local businesses. Show some love to your local small businesses and to your honey at the same time! Argenta Fall Foodie Fest Tomorrow!!!! I know, it’s almost tomorrow anyway (11 p.m. at this writing). Hopefully there are still a few of you up and on your computers, instead of out on the town or sleeping for tomorrow’s Race for the Cure. Like I said, I’ve been sick! But I did want to go ahead and give you a brief lowdown on tomorrow’s festivities. It really is going to be a foodie’s paradise. First of all, it’s the season’s last hurrah for the Argenta Certified Arkansas Farmer’s Market. Come get the latest fall goodies while you can! The most exciting part: Arkansas’ rockstar chefs from your favorite restaurants and catering companies, preparing their own specialties using locally grown produce and meats. Dishes will feature the fall harvest. Argenta Market, Starving Artist Cafe, Ashley’s Restaurant, Maddie’s Place and Ferneau Restaurant & Lounge are some of the participating vendors. The idea is you see what Arkansas farmers have to offer, then actually interact with chefs who know how to make it fabulous. How often do you get to do that? They’ll also have live music, arts and crafts, and the Virginia Clinton Kelley Festival for the Cure, offering free health information. So, you know it’s all about the plate of food you buy to eat. What will be cooking? How about these: Sweet Potato Tart, Beefalo Bratwurst, Sticky Toffee Pumpkin Pudding, Pork and Sharp Cheddar Quiche, Pumpkin Carrot & Lavender Soup, Arkansas Buffalo Chili, Tomato & Gorgonzola Soup, Winter Squash Soup (with Bacon Jalepeño Créme Fraîche) and Lindsey’s Fried Pies (Apple and Peach). Nom. Bring four or five bucks for each plate. Not bad for a meal that would probably cost two or three times that, at least, in their restaurants. Have I mentioned this is free? And so is the parking? And that food festivals just like this one are the rage all over the country, but usually have high-priced tickets? More on this tomorrow. I will be at the event, with my own booth. I’ll be live-blogging as the day goes on, so check back for more info. And for heaven’s sake, get over there and say hello!